Here’s the first in our series of telling time to the hour worksheets! The :00 has already been provided, all kids have to do is fill in the hour. 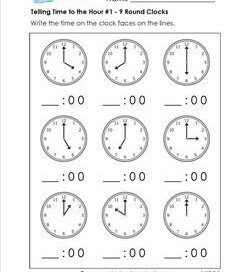 Round clocks like the ones on this telling the time to the hour worksheet can bee seen almost everywhere. Do you have one in your classroom? Round and round and round we go! Where is the hour hand on these clocks going to land? Check out this telling time to the hour worksheet and find out! You don’t have to be a double agent to fill in the number before the 00 for the times on these clocks. Just be quick, smart, and have fun! Another telling time to the hour worksheet! Have some fun and time your kids. See who can finish first, second, and third. Give a big “Whoo! Hoo!” to the winner. Copy this telling time to the hour worksheet on the back of any other telling time worksheet and have double the fun and practice of reading clocks! 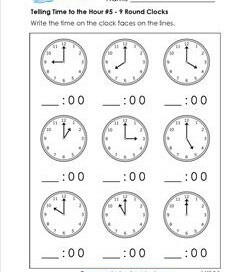 In this telling time worksheet kids write the times on the clock faces on the lines. Answer sheet included tells the time as 3:00, 4:00 etc. What time is it? It’s time to tell time! Your kids need to figure out the time on each clock and write the time on the line. On your marks … Ready, set, go! Hooray for telling time worksheets! The minute hands are all on the 12, but where are the hour hands? You can review which hand is which with your kids. What could you use an alarm clock for? What time do you set it to for getting up in the morning? How do you turn it on and off? What sound does it make? Kids write the times to the hour on the lines under each alarm clock looking at each hand carefully. 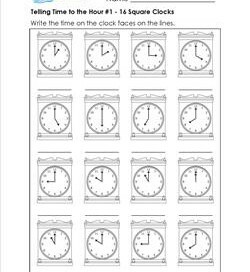 Then they can color the clocks. Why not color in a pattern? In this telling time to the hour worksheet kids write the times on the lines. Choose 3 times. Tell why an alarm could be used for that hour. 12:00 is for lunch time! Need a challenge? Try this worksheet with 16 clocks per page. I know, for some kids, this will be a whiz. Have those kids check their answers with a friend. What’s round and square at the same time and has two hands that go in circles? You got it! 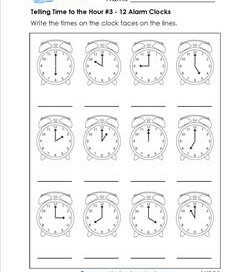 The 16 clocks on this telling time to the hour worksheet! Don’t be square. Be in tune with the times! The times on these telling time worksheets, that is! Check out the clocks and write the times on the lines. Where do we go at certain times of the day? Have kids give you some examples as they write the times on this telling time to the hour worksheet.